The Smithsonian National Zoo has audible confirmation of a new panda cub, they just haven’t caught a glimpse of the little guy. Mama Mei Xiang is being very protective of the cub born Sunday night. She’s not leaving the nest, blocking the cub from view of the panda cam. "Like everyone else, I’m glued to the panda cam for my first glimpse of the cub!” National Zoo Director Dennis Kelly said in the press release announcing the birth. Megan McGrath with the latest on Mei Xiang's cub. Now the zoo wants everyone else to help them get the first baby picture. 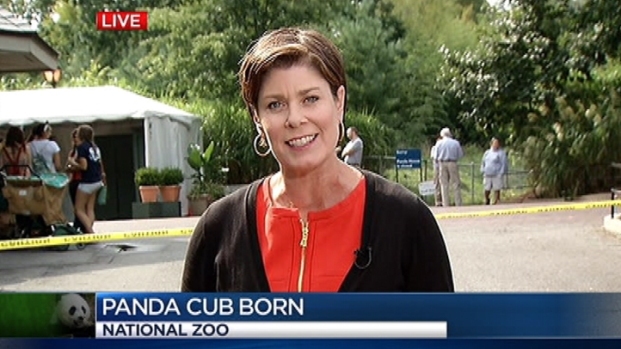 “And the @NationalZoo wants your help w/ #cubwatch. If you see the cub on the pandacam, tweet them a screen grab s.si.edu/dMsKv,” the Smithsonian tweeted Monday. So you don’t need to wait for a naming contest to get involved in the zoo’s next biggest draw. If Mei Xiang allows a glimpse of something resembling a stick of butter, get a picture and share!